Today is a happy day! I finally get to send this quilt off in the mail! I made this Quilt of Valour as part of the Northcott Sesquicentennial Quilts of Valour Challenge and it will be donated to Quilts of Valour Canada and will soon be owned by a Canadian soldier or veteran. 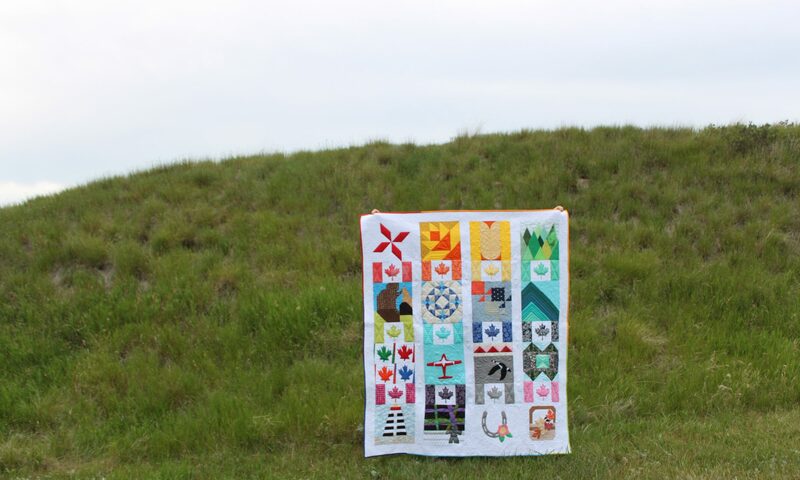 Canadian Flag in a Pixelated Heart Quilt by Anita LaHay of Daydreams of Quilts. I am sorry the photos are not more scenic but it is very windy today in Wainwright (as usual) so we needed to shelter behind the house. The challenge was to create a Quilt of Valour using only Northcott Sesquicentennial fabrics. I designed this quilt with the challenge in mind. The pattern for this quilt is available at Daydreams of Quilts, on Etsy and on Craftsy. This is the second style option in the pattern and I have simply added borders to bring the size up to the required size. I purchased a panel for the back and used fabrics left from the front to piece the back to the size I needed. There is a Quilt of Valour label in the bottom left corner. I quilted with Aurifil 28 weight thread in colours matching the fabrics. The heart is in red thread, the green border is feathers quilted with green thread and the blue border is wishbones in blue thread. The cross hatches in the heart are 50 weight Aurifil in white. Aurifil 28 weight thread was also used for the machine blanket stitch applique around the edges of the maple leaf. The red, green, blue and yellow are Hudson’s Bay colours which I think is very cool. I am inspired to make a Hudson’s Bay point blanket quilt now. Turned out beautifully. It would work as a reversible quilt. Next PostNext Victoria Day Weekend Pattern Sale and Craftsy Supplies Event!